Sophie Hastings was awarded a scholarship to study drum kit, percussion and timpani at The Royal Northern College of Music in Manchester and graduated with an honours degree and postgraduate diploma in music. Since then, she has performed and toured with many major orchestras and touring shows playing drum kit, Latin and orchestral percussion. 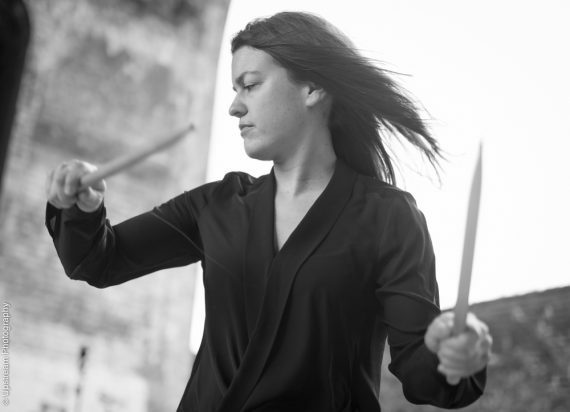 In 2002 Sophie joined the innovative percussion quartet 4-Mality formed by Adrian Spillett, winner of the prestigious BBC Young Musician of the Year competition. The group have featured at the BBC Proms, the Berlin Philharmonie and frequently tour internationally. In addition to her performing career Sophie has furthered her musical education in Cuba and Brazil studying the ever evolving music of rumba, salsa, mozambique, comparsa, bata, samba and maracatu with master percussionists from Afrocuba de Matanzas, Clave y Guaguanco, Obba Wemilere, Los Companadores de Batea, Orchesta Sublime, GRES Portela, Monobloco and Rio Maracatu. She has also studied Candomble with Ney De Oxossi, samba de roda with Fabiano Salek, frame drums with Glen Velez and konnokol with Lori Cotler. School Of Music. Her teaching focusses on providing students with the language required by today’s drummers and percussionists, allowing them to develop the skills needed to perform in any musical situation.